A few kilometres downstream of Bacharach is the city Oberwesel. It is not as famous and picturesque as Bacharach, but it is ancient and was already populated by the Treverians in Celtic times. In the third century A.D. Wesel (the later Oberwesel) was mentioned as one of the stops on the Roman military road along the Rhine, where people rested and changed horses. Later, after the withdrawal of the Roman troops, the Franconians declared it to be the new administrative centre and fiscal district for the Middle Rhine area including the surrounding villages, and named it "Wesalia" (or "Vesalia" or "Wesile"). Around the turn of the century Wesel was owned by Archbishopric Magdeburg. Only under Emperor Friedrich II Wesel sealed the imperial immediacy. In 1216 Wesel, being economically quite successful, received its city rights including its own seal, the "Sigillum Civitas Wesalie". Around this time the first city fortification was built. A hundred years later, under the Treverian elector and archbishop Balduin of Luxemburg (1307-1354), the city, including the city Boppard further downstream, was owned by the archbishopric of Trier. With expansion of the fortification towards the northern suburb the "Niederburg" developed. The inclusion of the southern parts of the fortification happened much later, in the middle of the 15th century. The medieval fortification consisted of at least 21 towers (18 of which still exist today), several city gates, the Niederburg as well as the Northern Ochsenturm (=Ox tower). In total it is one of the best-preserved medieval fortifications of this kind in the Rhineland. It comes as no surprise then, that in Oberwesel this cultural heritage is looked after with great enthusiasm. This attitude has enabled the preservation of numerous lovingly restored half-timbered houses along the main road leading through the town centre. 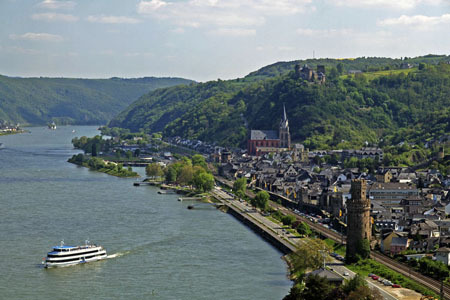 The name "Oberwesel" was used from the 17th century onwards, to avoid confusing it with the town Wesel on the Lower Rhine. You can see Oberwesel's medieval Liebfrauen Church from far away, not only because it is located a short distance outside the city centre on a small hill, but also because of its radiant red colour. It was built between 1308-1351, in the High Gothic period, and contains one of the oldest and most precious high altars in the Rhineland. Five medieval bells dating from 1353-1404 are some of the most valuable treasures of this Basilica, which has a particularly high central nave flanked by two lower side aisles. Next to the church is the start of the path up to Castle Schönburg. From there you have a beautiful 360-degree view: To one side you see the Liebfrauen Church and Oberwesel, and upstream the Fortress Pfalzgrafenstein lies in the distance, located in the middle of the Rhine near the little town of Kaub. The 12th century Schönburg lies on a mountain spur that falls down steeply in three places. This is why this fortress is a "threefold" fortress, with three keeps and three living areas for the same branches of the very old noble "von Schönburg" family. The fortress can only be accessed via a narrow ridge in the north as it is surrounded by steep rocks On that side the fortress is defended by walls several metres thick, with battlements and embrasures imbedded in them. These do not fail to impress visitors even today. After the destruction of the fortress by French troops in 1689 the ruins remained forgotten for 200 years, but they eventually came into possession of Americans who completely rebuilt it in 1885. Today Schönburg is owned by the city Oberwesel, and the chambers of the fortress accommodate a restaurant, and a hotel as well as a youth centre. On the sun kissed slopes surrounding the castle are 72 hectares of vineyards, helping to make Oberwesel one of the biggest wine growing communities around the Middle Rhine. The medieval Silhouette of Oberwesel and its special "romantic" atmosphere made it THE meeting place for romantics in the 19th century. Most notably the English poet Lord Byron (1788-1824) contributed to the fame of the Rhine valley with his romantic poems ("The castled crag of Drachenfels frowns o'er the wide and winding Rhine, whose breast of waters broadly swells between the banks which bear the wine"). After this the flow of visitors to the Middle Rhine regions started. This was the age of poets and composers like Heinrich Heine, Friedrich Silcher, Hoffmann von Fallersleben or Karl Simrock who glorified the "romantic Rhine" with their work.